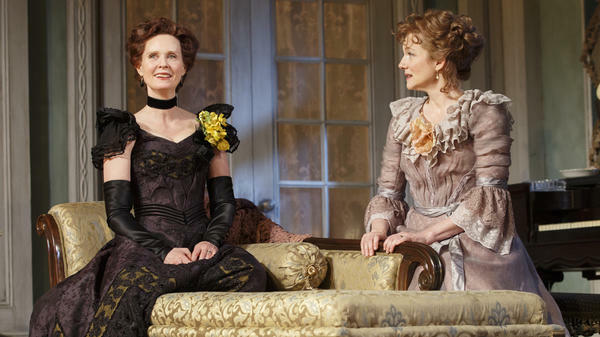 Cynthia Nixon (left) and Laura Linney alternate playing the roles of Regina (left) and Birdie in The Little Foxes. Look carefully: Linney (left) and Nixon have switched roles. It started when Linney got a call from the Manhattan Theatre Club, asking her if she'd like to play Regina Giddens, the steely character at the center of The Little Foxes. Tallulah Bankhead introduced the role and it's been played by actresses from Bette Davis to Elizabeth Taylor. "Women don't get these parts very often," Linney says. "This is a great part." But she was also attracted to a smaller role in the play — Birdie, Regina's abused, alcoholic sister-in-law. "I had always loved Birdie. There was something about Birdie that I inherently understood," Linney says. So, Linney had an idea: What if she and her friend could find a way to share both roles? Nixon was more than game. "I mean, who does that?" Nixon asks. "Nobody does that: 'I have a great part. Would you like to do it half the time?' "
For director Dan Sullivan, who's worked with both women separately, these two actresses in these two roles makes perfect sense. "They both have within their skillset, the sort of girlishness of Birdie and the huge strength and power of Regina," Sullivan explains. Linney and Nixon each bring their own different interpretation to the roles. They emphasize different words; one may stand to deliver a line, while the other sits. "Great parts are meant to be played; they're not meant to be owned, they're not meant to be claimed. They're meant to be played!" Linney says. And it's not just about getting a crack at two great parts. "It's fascinating to see how one person and their interpretation or nuances of quality can shift and change an entire dynamic," Linney says. "I found that all very interesting; what does that do to everybody else? What does that do to the play?" And, of course, how do you rehearse two actresses switching roles? Sullivan says he added a week to the rehearsal schedule and both women were in the room throughout the entire process. "We had never done it before, so we didn't quite know how to do it," Sullivan says. "And thank goodness both Cynthia and Laura are very generous people and look out for one another. So, you know, it would be, for instance, Laura would come to me during rehearsals and say, you know, Cynthia actually hasn't done this part of the play yet. You should give her a chance. Or vice versa." Each character in Hellman's turn-of-the-20th-century melodrama responds in a different way to a world ruled by men, says Nixon. "When you're playing Regina you're playing someone who is at the center of everything," Nixon says. "And when you're playing Birdie, you're always on the outskirts and you're always sort of forgotten about." Ultimately, both actresses think The Little Foxes, which looks at an avaricious Southern family, is surprisingly timely. "Given where we are now and given where our culture is now — particularly looking at money and power and what do you value and what do you not value — it's sort of shockingly right on point," Linney says. The show is playing through June and if you're really curious to see how different Linney and Nixon are in the roles, do what I did, and make it a double header — with matinee and evening performances on Wednesdays and Saturdays. "The Little Foxes," Lilian Hellman's 1939 melodrama, has two great roles for actresses over the age of 40. 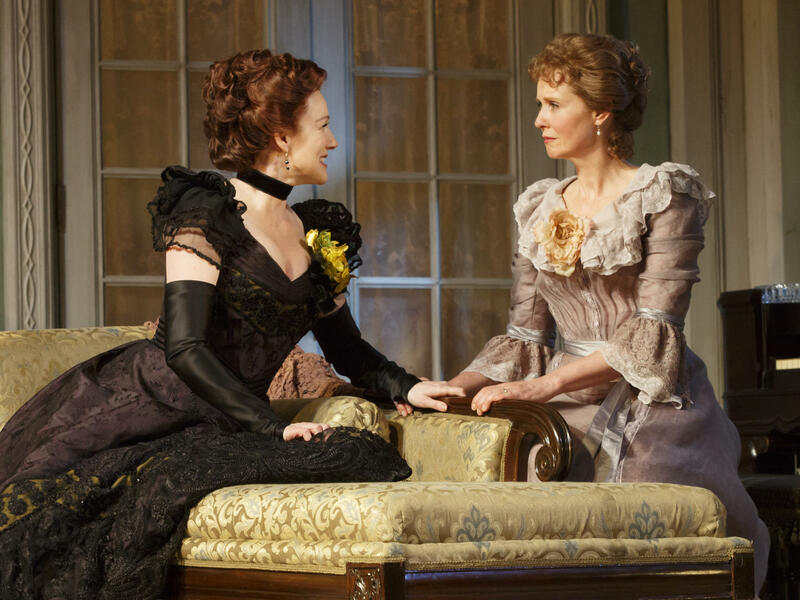 And a new revival on Broadway features two big stars - Laura Linney and Cynthia Nixon. The twist - both actresses play both roles. They alternate between performances. Jeff Lunden has more. JEFF LUNDEN, BYLINE: It started when Laura Linney got a call from the Manhattan Theatre Club asking her if she'd like to play Regina Giddens, the steely character at the center of "The Little Foxes." LAURA LINNEY: You know, women don't get these parts very often. This is a great part. LUNDEN: But she was also attracted to a smaller role in the play - Birdie, Regina's abused, alcoholic sister-in-law. LINNEY: I had always loved Birdie. There was something about Birdie that I inherently understood. LUNDEN: So Linney had an idea. What if she and her friend Cynthia Nixon could find a way to share both roles? Nixon was more than game. CYNTHIA NIXON: I mean who does that? Nobody does that. I have a great part. Would you like to do it half the time? I mean who does that? LUNDEN: In the first act, both actresses play a scene together after they've met with an investor who's going to make their family rich. NIXON: (As Regina Giddens) Can't you tell when you're being admired? LINNEY: (As Birdie Hubbard) Oscar said I bored Mr. Marshall, but he admired you. He told me so. NIXON: (As Regina Giddens) What did he say? LUNDEN: For director Dan Sullivan, who's worked with both women separately, these two actresses in these two roles makes perfect sense. DAN SULLIVAN: They both have within their skillset this sort of girlishness of Birdie and the huge strength and power of Regina. LUNDEN: The two actresses emphasize different words, and one may stand to deliver a line while the other sits. Here's the same scene with the parts reversed. Notice how Linney plays it for a laugh. LINNEY: (As Regina Giddens) Can't you tell when you're being admired? NIXON: (As Birdie Hubbard) Oscar said I bored Mr. Marshall, but he admired you. He told me so. LINNEY: (As Regina Giddens) What did he say? Great parts are meant to be played. They're not meant to be owned. They're not meant to be claimed. They're meant to be played. LUNDEN: And it's not just about getting a crack at two great parts, says Laura Linney. LINNEY: It's fascinating to see how one person and their interpretation or nuances of quality can shift and change an entire dynamic. And I found that all very interesting. What does that do to everybody else? What does that do to the play? LUNDEN: And of course, how do you rehearse two actresses switching roles? Director Dan Sullivan says he added a week to the rehearsal schedule, and both women were in the room throughout the entire process. SULLIVAN: We had never done it before, so we didn't quite know how to do it. And thank goodness both Cynthia and Laura are very generous people and look out for one another. So for instance, Laura would come to me during rehearsals and say, you know, Cynthia actually hasn't done this part of the play yet (laughter); you should give her a chance, or vice versa. LUNDEN: Each character in Lillian Hellman's turn of the 20th century melodrama responds in a different way to a world ruled by men, says Cynthia Nixon. NIXON: When you're playing Regina, you're playing someone who is at the center of everything. And when you're playing Birdie, you're always on the outskirts. LUNDEN: But in the third act, she has her moment. NIXON: (As Birdie Hubbard) My family was good. And the cotton on Lionette's (ph) fields was better. Ben Hubbard wanted the cotton, and Oscar Hubbard married it for him. LINNEY: Looking at money and power and what do you value and what do you not value, it's sort of shockingly right on point. LUNDEN: The show is playing through June. And if you're really curious to see how different Laura Linney and Cynthia Nixon are in the roles, you can make it a doubleheader with matinee and evening performances on Wednesdays and Saturdays. That's what I did. For NPR News, I'm Jeff Lunden in New York. (SOUNDBITE OF MAYNARD FERGUSON'S "THREE LITTLE FOXES") Transcript provided by NPR, Copyright NPR.